When England's cricketers take to the field against Australia at Trent Bridge, Nottingham, on Wednesday, they will be competing for one of sport's most historic prizes - the Ashes. But what are they? Why are they so important? And, more importantly, who is going to win them this summer? 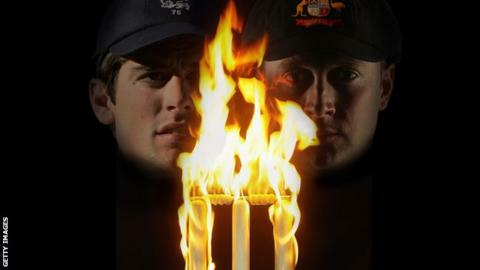 Here is BBC Sport's guide to one of the biggest and oldest cricketing rivalries. Following England's first defeat by Australia on home soil at The Oval in August 1882, the Sporting Times carried a mock obituary of English cricket, which concluded that: "The body will be cremated and the ashes taken to Australia." A sporting obsession was born and Ivo Bligh, England captain at the time, pledged to win back "the Ashes" on the return tour to Australia a few weeks later. Although the hosts won the first Test, a match played over five days, England won the next two and succeeded in winning the series. To mark the achievement, Bligh was given a small terracotta urn as a symbol of the Ashes that he had travelled to Australia to regain. The two countries have competed for the symbolic urn in both countries ever since. There have been 310 Ashes Tests since 1882, with Australia winning 123 and England 100. In 66 Ashes series, Australia have won 31 and England 30. The Ashes are perceived as the pinnacle of Test cricket for both English and Australian cricketers. The closely linked history of both countries means it has always been a fiercely contested competition - and it was the source of cricket's first major controversy in 1932-33. During a tour down under, England captain Douglas Jardine devised a plan to stop legendary Australian Donald Bradman, widely regarded as the game's greatest ever batsman. The series was nicknamed "Bodyline" as Jardine instructed his bowlers to bowl fast and at the body of their opponents - tensions coming to a head when Australian batsman Bert Oldfield collapsed with his skull fractured by a lightning-fast delivery. England won the series 4-1, but relations between cricket administrators in both countries became strained. While it is more amicable between the teams in the modern day, there is still a competitive edge between both sides. From Allan Border to Sir Ian Botham and Shane Warne to Andrew Flintoff, Ashes folklore is littered with tales of stellar performances against the oldest of cricketing enemies. In 131 years of Ashes cricket, it's impossible to name every Englishman to have made an impact against Australia. However, one of the most iconic series came in 1981 - and was nicknamed "Botham's Ashes" after the home side's all-rounder Ian Botham, who had resigned from the captaincy after the drawn second Test. Australia took a 1-0 lead into the third Test at Headingley and England slumped to 135-7 in their second innings, still 92 runs away from making the Aussies bat again. At one point, odds of 500-1 on an England victory were available. But Botham, batting at number seven, scored a scintillating, unbeaten 149 from 148 balls to help set Australia 130 to win the match. Kim Hughes's men were still expected to triumph - but Bob Willis took eight wickets for 43 runs and they were all out for 111. Botham then took 5-11 in the fourth Test as the Aussies were bowled out for 121 chasing 151 to win, before he scored another century at Old Trafford to seal a series win. When the 2005 series began, England had not beaten Australia since 1986-87 and had suffered some chastening defeats at the hands of all-time greats such as Shane Warne, Glenn McGrath and the Waugh brothers, Steve and Mark. Australia won the first Test and appeared on course to complete an unlikely victory in the second at Edgbaston when they inched to within one blow of winning after recovering from 175-8 to reach 279-9. But Michael Vaughan's men managed to complete a two-run victory when Steve Harmison removed number eleven Michael Kasprowicz. England won the fourth Test at Trent Bridge, sandwiching draws at Old Trafford and The Oval, to win the series 2-1 and beat Australia for the first time in 18 years. Lancashire all-rounder Andrew Flintoff, with 402 runs and 24 wickets, followed Botham in becoming a national hero and was later voted BBC Sports Personality of the Year for his exploits, while all of England's players were made MBEs or OBEs. Australia have not won the Ashes since their 5-0 whitewash of England in 2006-07 - ending 20 years of dominance in which they won nine out of 10 series. That era coincided with a period where Australia dominated world cricket, with Border, Warne, McGrath and the Waugh brothers dominating their opponents. Bradman has scored more Ashes runs than anyone else (5,028), while former captains Border (3,222), Steve Waugh (3,173) and Ricky Ponting (2,476) epitomised the fighting spirit and sheer class of the sides they led in Australia's most dominant period between 1987 and 2007. With the ball, nobody has tormented English batsmen more than leg-spinner Warne, who bowled Mike Gatting with his first ball in Ashes cricket and proceeded to take 195 English victims - 38 more than his nearest rival, fast bowler McGrath (157). England have won the last two Ashes series, home and away - losing just twice in 10 Test matches against Australia. Several Australian greats - Warne, McGrath, Adam Gilchrist, Matthew Hayden and, more recently, Ponting - have retired and their replacements have struggled to replicate such dominance. In contrast, England have developed a settled team with a number of established players with proven track records in Ashes series. Alastair Cook,Jonathan Trott,Kevin Pietersen,James Anderson and Graeme Swann have all enjoyed success against the "Baggy Greens", Australia's nickname on account of the caps their players wear while fielding. Who are the key men this summer? England captain Cook has more than 7,500 Test runs to his name at the age of 28, including four hundreds and a top score of 235 not out against Australia. He scored 766 runs - almost 200 more than anyone else in the series - as England beat Australia down under for the first time since 1987 in the winter of 2010-11. The England bowling attack is led by Anderson, who is joint-third on the all-time list of England Test wicket-takers with 307. His ability to swing the ball both ways has been crucial for England in their last two successful series. Like Cook is for England, Australia captain Michael Clarke is the stand-out batsman in his side's line-up and one of the few men in the squad with plenty of Ashes experience. He leads from the front, averaging 66 runs per innings in his 24 Tests as captain as opposed to 46 when not in charge. Unlike England's experienced bowling attack, there are some new faces in the Australian line-up, but plenty is expected of 23-year-old fast bowler James Pattinson, who has taken 40 wickets in 10 Tests. Is it safe to assume England will win the Ashes again? No. While England are favourites to win both this summer's home series and the winter's return series, Australia are renowned for their fighting spirit. Clarke,Pattinson, all-rounder Shane Watson and left-arm fast bowler Mitchell Starc can all cause England problems and are more than capable of being match-winners. England are ranked third in the world, behind South Africa and India, while Australia are fourth. Perhaps a good indicator of the quality of the two teams came when they both toured India last winter. England won their four-match series before Christmas 2-1 while Australia suffered a 4-0 whitewash. Sir Ian Botham certainly thinks so, predicting England will win all 10 Tests the two countries will play in home and away series. However, there has only been one whitewash between the two sides in the last 92 years. Heading into the series, England started their Test summer with a 2-0 victory over New Zealand but Australia have not played since losing to India in February and March. Australia's build-up has also been affected, with their South African coach Mickey Arthur sacked and replaced by Darren Lehmann just 16 days before the series was due to start. Arthur was criticised following poor performances and disciplinary issues within the camp - most notably when batsman David Warner was suspended until the first Ashes Test, and fined £7,000 (AU $11,500), for punching England's Joe Root in a bar following Australia's defeat to England in the Champions Trophy. Why are they playing each other so many times? Modern Ashes series are played over five matches. Four years traditionally separate each home series, with the one in Australia played in the winter of the year following their tour of England. This time, though, Australia have moved their home series forward by 12 months to avoid a clash with the 50-over World Cup they are hosting with New Zealand in 2015. Ex-England captain Sir Ian Botham: "I haven't seen anything to remotely make me feel as though I need to change my initial prediction of a double 5-0." Australia opener Ed Cowan: "We feel that we have a squad that can really match them in these conditions. If our top order stands up, it will be a hell of a lot closer than the British press are making out." Former England captain Allan Lamb: "I don't think England are going to have a problem. I would say 3-0. England's players are not talking about it but they can sense blood." Former Australia batsman Damien Martyn: "We're starting to believe that we can win this, we can compete with England and pull off a win. In Australia, there's a huge buzz now the coach has changed. There's a lot more excitement."